The creation of weapons of mass destruction continues to spread global fear for its hazardous effects and massive environmental catastrophe. The use of nuclear power has emerged to be an essential element for a developing nation but behind its major contribution to the world lies the man’s desire to expand military prowess over other nations. Nuclear weapons were created not only for military defense but to release nuclear radiation and eliminate all matters without consideration at the drop site. Two of the most fearful and destructive war elements, the atomic bomb and the hydrogen bomb will be discussed. Do atomic and hydrogen bombs have any difference? Why does hydrogen bomb stronger than atomic bomb? Both the atomic and hydrogen differ in several comparative ways. Hydrogen bomb is considered more powerful than an atomic bomb because of their respective principles and relative strengths. Both these bombs use Uranium and Plutonium radioactive elements to create nuclear power but differ on how the elements are used. Hydrogen bomb is also known as “Thermonuclear” bombs and generates energy from a fission bomb to compress and heat fusion fuel. An atomic bomb works by atomic fission or splitting of atomic nucleus while hydrogen bomb works by atomic fusion or combining atomic nuclei. By principle, fission makes radioactive elements splits from large atoms to smaller ones while fusion combines small atoms to create bigger ones, making the hydrogen bomb release more energy than atomic bomb. The energy released by atomic bomb is million times greater than that released in chemical reactions whereas hydrogen bomb can release three to four times more of atomic bomb. Atomic bombs are also believed to have a ton of TNT up to 500,000 tons of TNT so we can roughly gauge how dangerous a hydrogen bomb can be. Atomic bombs are set off by an explosion from a TNT-detonating device. This causes the radioactive elements (Uranium-235 and Plutonium-239) to collide with each other in high amount of energy. This sets off a chain reaction with more atoms breaking down and the energy is released. The hydrogen bomb on the other hand is set off with actual presence of atomic bomb. The radioactive elements are joined tightly together in a manner similar to nuclear fission causing a nuclear fusion. By product, atomic bomb produces highly radioactive particles after the energy has been released while radioactive particles of the hydrogen bomb are triggered after the explosion. We can surely imagine the magnitude of destruction for both atomic bomb and hydrogen bomb by simply recalling the Hiroshima and Nagasaki bombing in 1945. 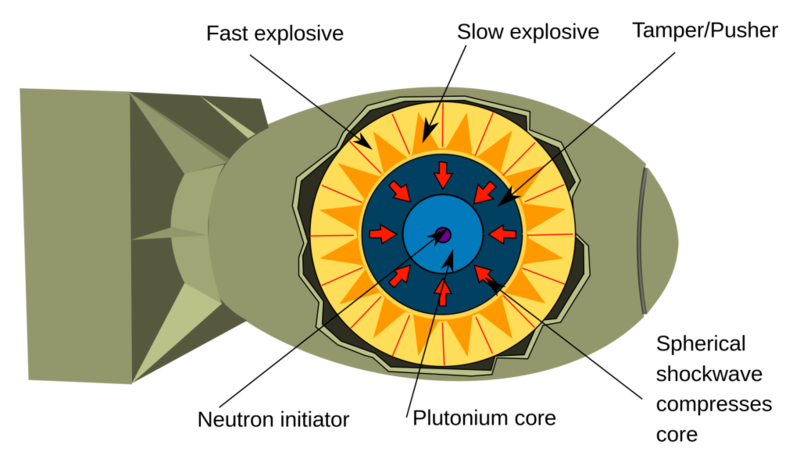 To date, no records of nuclear fusion bombs used for warfare, though governmental defense programs have put considerable research into such a production possibilities. 2. Atomic bomb works by nuclear fission while hydrogen bomb works by nuclear fusion. 4. Hydrogen bomb can be detonated with atomic bomb. charm. "Difference Between an Atomic Bomb and a Hydrogen Bomb." DifferenceBetween.net. May 21, 2015 < http://www.differencebetween.net/technology/difference-between-an-atomic-bomb-and-a-hydrogen-bomb/ >.